Be sure to read to the end. This ship has a colorful history and a special connection to Jimmy Buffett and the Coral Reefer Band. The 282 foot five-masted barkentine Monfalcone was built in 1919 by International Shipbuilding in Orange, Texas. She was the last ship completed before International Shipbuilding closed their doors in 1920. Monfalcone sailed out of New Orleans and other Gulf Coast ports for the following three years until she was sold to a Los Angeles buyer. On May 30, 1923, Monfalcone left New Orleans for Los Angeles, where she was to unload her cargo and begin her new trade on the Pacific Coast hauling lumber. However, three days out, she was struck by a hurricane, dismasted and lost much of her deck cargo. Blown hundreds of miles off course, she eventually limped into Colon, near the Panama Canal with her crew half starved and low on water. The salvage tug Peacock towed her 3,000 miles to Los Angeles and on November 7, 1923 she was auctioned off for $5,250, considered a small sum for one of the largest sailing vessels afloat at the time. She was soon moved to the Craig Shipyard for re-rigging and repairs. Described as “…a beautiful craft with lines modeled directly after the old clippers. She has a deep, sweeping shear, a finely modeled stern, while surmounting her true clipper bow is the figurehead of an American bald eagle.” Such an attraction lured the Hollywood Photoplay Productions to use her as a set for “Puppy Love” in May of 1924. In 1925, most sailing vessels were laid up due to poor market conditions and competition from steamers. In 1928 the Monfalcone was used as a fishing barge off Balboa, CA. In October of 1928, she was purchased by J. W. Brynes, H. O. Dougherty, N. L. Oswald and J. L. Dragna, and reworked in the West Basin of LA Harbor into a “pleasure barge” with “Gaudily painted sides and her interior transformed into a cafe and casino that equals the best Mexican resorts.” A huge covered dancing pavilion was added above her main deck and gambling tables were set up, all at a cost of $58,000. 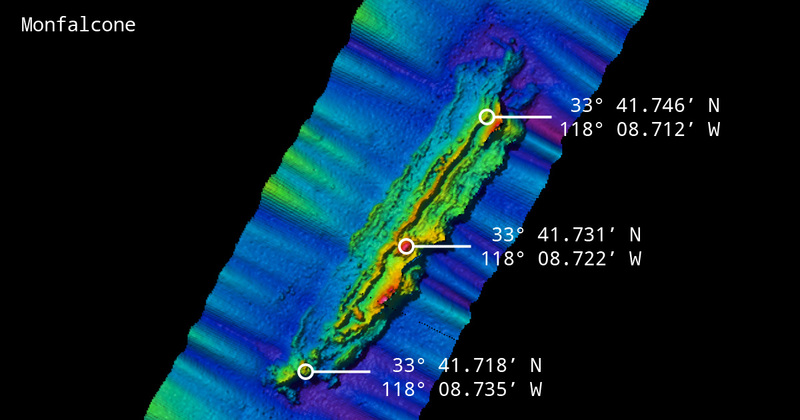 On November 22, 1928, she was towed out 6.5 miles off the coast. Formerly licensed as a fishing barge, her license was canceled making her “a ship without a country” and not bound by Federal Statutes–an invitation for litigation. Shortly afterwards, the Coast Guard determined she was a hazard to navigation and towed her into port. The Coast Guard also towed her back in August and December of 1929. In mid August of 1929, a new law went into effect making it illegal to transport passengers from the shore directly to the gambling barges. To circumvent the law, the Centennial was used an intermediary barge, where passengers were dropped off and picked up by another boat and taken to the Monfalcone. The following November, the Monfalcone was moored off the end of “gambler’s row,” some 2.7 miles off Seal Beach, CA on the border between Los Angeles and Orange counties. The new law was ruled unconstitutional and local law enforcement and politicians unsuccessfully solicited the help of US District Attorney to once more declare the Monfalcone as a hazard to navigation at her new position. Problems not only came from local law enforcement, the owners also had problems from their competition. In May of 1930, a gang from the rival gambling barge Johanna Smith boarded and seized the Monfalcone for a short time. 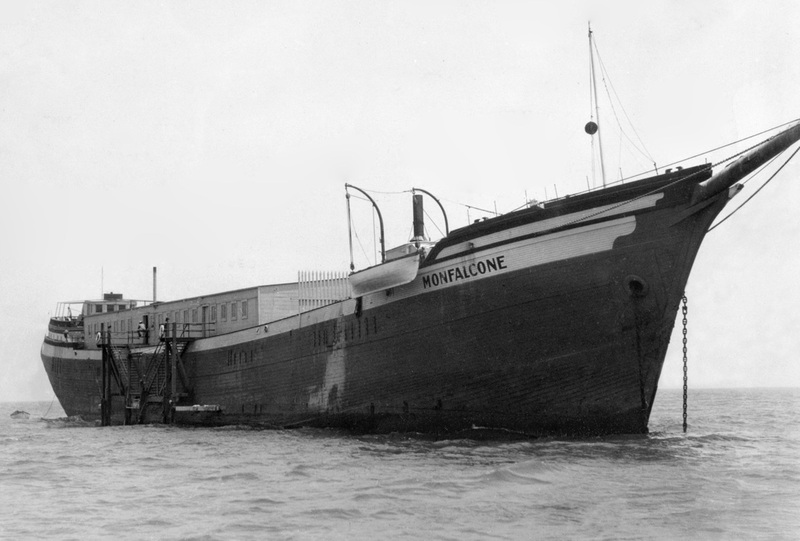 On Saturday evening August 31, 1930, some 300 people were on board the Monfalcone when a broken gas line caught fire and ignited the wooden barge. Three minutes later, the barge went dark. The checkroom girl had to light a candle so she could return the coats and jackets to the customers. The orchestra continued to play as the passengers boarded the lifeboats. The dealers were said to have returned the money to the safes and what became of the money in play will never be known. Four of the dealers panicked and one jumped overboard. Another followed to his rescue. No one was injured. The barge burned all night, attracting many boats and cars lined up off the nearby beach. Early Sunday morning, the barge sank to the bottom, some 75 feet below. An owner, Tommy Jacobs, immediately employed Merritt Chapman & Scott to locate the barge and recover the safes. 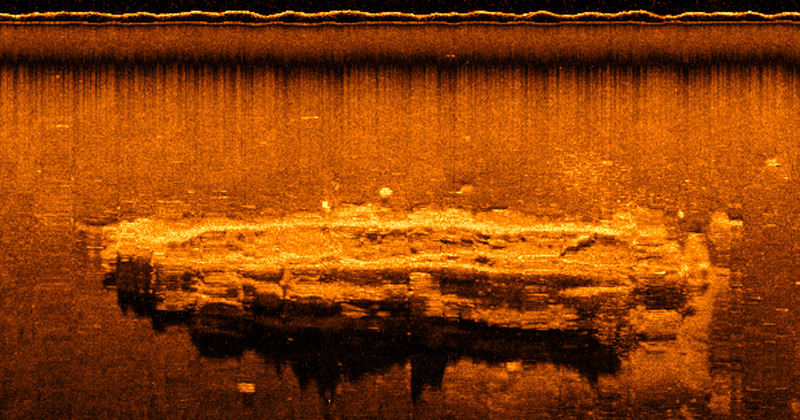 Divers Charles Smale and William Lahti located the wreck and a safe, only to find the door of the safe open. Another safe was recovered a few days later with $3,000, but it was estimated that some $25,000 in play was lost. Another safe believed to have contained some $11,000 remained missing. 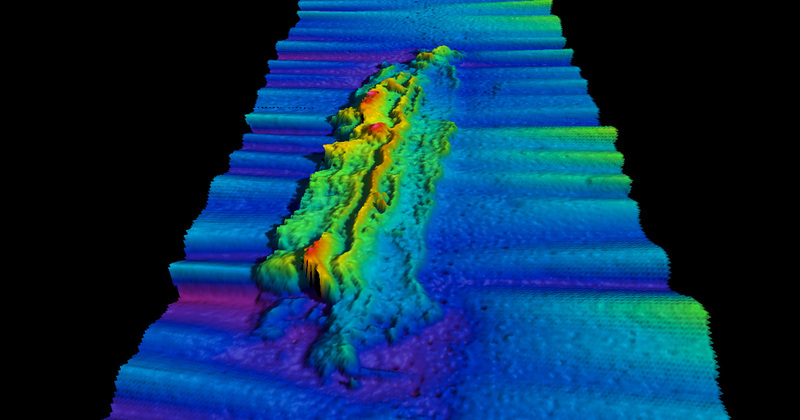 Today the wreck of the Monfalcone rests in 75 feet of water off Long Beach, CA. 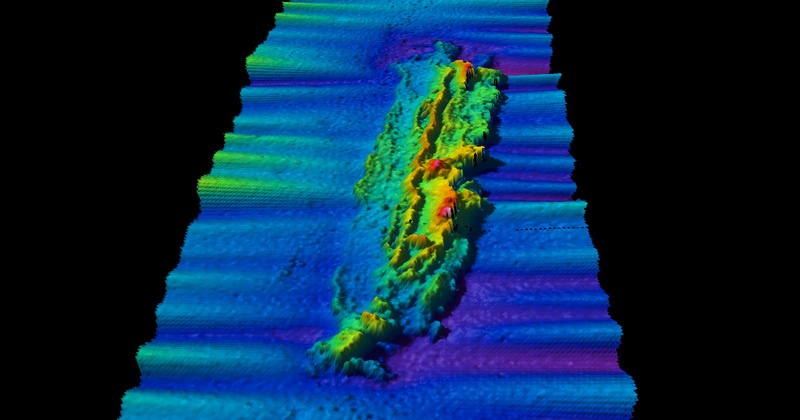 NOAA Ship Fairweather surveyed the wreck site with multibeam sonar in 2013 during survey cruise H12618. So what’s the big connection to Jimmy Buffett? Monfalcone’s first master was Jimmy Buffett’s grandfather, Captain James Delany Buffett. Captain J.D. Buffett sailed Monfalcone on her maiden voyage hauling three million feet of lumber from New Orleans to Havana, Cuba. Also onboard were his wife and young son J.D. Buffett, Jr., Jimmy Buffett’s dad. Captain Buffett would later be the inspiration for at least two of Jimmy Buffett’s songs. Two of my favorites. The Captain And The Kid, and Son Of A Son Of A Sailor. 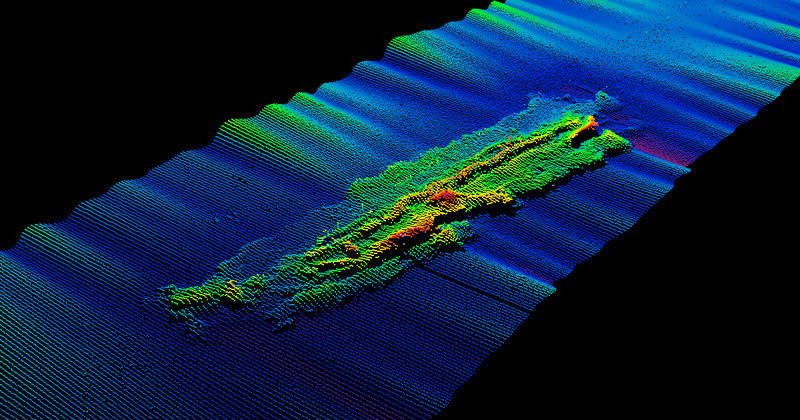 A special thanks to Steve Lawson for providing much of the historical research on the Monfalcone.